This week didn't see much gaming, but more sitting around talking. Of course I got there later than usual since I had to work but that doesn't stop us from trying to get out of the house at least once a week. We did manage to do some simple sculpting and talk about using greenstuff. When it comes to greenstuff, there is so much you can do with it, the possibilities are endless. What we were talking about though is just the basic stuff. One of the guys brought in his Sammael with a good sized gap at the waistline. With something like this, you don't need to be perfect. 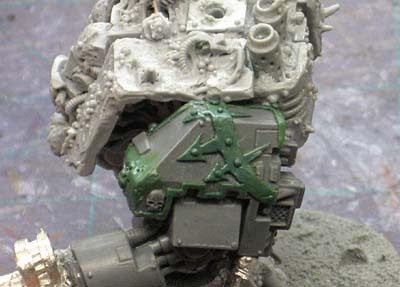 It's really just a matter of filling the gap (which adds support too) and making it so that when you paint it, you don't have the deep recess there that will stand out especially if you're going with a Codex paint scheme. If you were painting his robes black, you might not even need to fill the gap since it would be hidden. Greenstuff is perfect for this kind of thing. 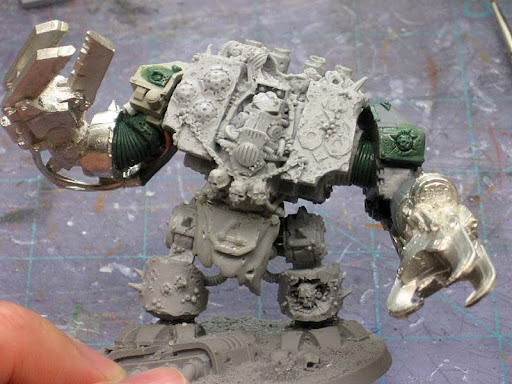 The other model we worked on was this Forge World Nurgle dreadnought. One of the guys converted him up and wanted to reposition his arms. Filling in something like this is a bit more involved and I ended up taking the model home to work on it in stages for him. Sometimes you can't do it all in one sitting because you need to work on a small area and let it cure before moving on. With this model, there was a HUGE gap between his shoulder and arm with the way it was positioned. No big deal, but there was some work to do to make it look "believable." 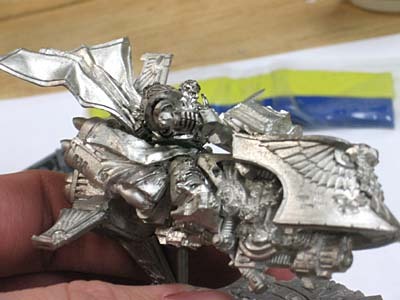 You don't have to sculp every little detail, just enough that when the viewer looks at the model, they "think" they see all the detail and they assume it's all there. I started by adding a few more elements to the joint. First were the rest of the cables attached to the arm. I didn't want them to just dead end without going anywhere. Nothing looks worse. Then I added a small section of upper arm. After I had all that in place, I went in and added "flex-fitting" between the joints. Like the stuff Space Marines have at all their armour joints. Once I had both arms finished, I went in and added some "Nurgle" effects to his shoulders since they weren't the original pieces. His right shoulder had a Chaos star on it so I went ahead and replicated that on his left shoulder pad too. And the finished model. I spent today adding little bits to him between painting other projects this afternoon. I hope my friend likes him, I didn't mention adding the Chaos star or the nurgly-effects, but I figured they made the model look better so I added them. Good stuff. Fridays are typically my "get out of the house" days. After taking care of two kids all week, that one day a week is invaluable for preserving your sanity! Very nice Ron, the pose is great and it adds some nice movement to the dread, most dreads tend to look very static, and the greenstuff work is nice and very believable, I think he will be thrilled, I would. It's definitely worth getting out once a week and just hanging out with 40k friends. That dread looks boss (yeah, I said "boss" and if you hang around for a while, you might hear me say "Rad" or "tubular" as well!). 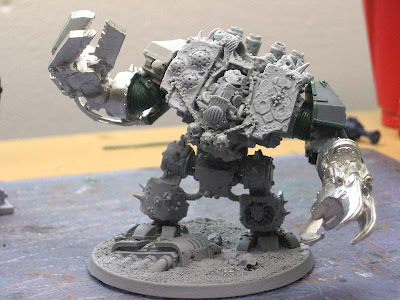 Is his right arm a Forgeworld arm? 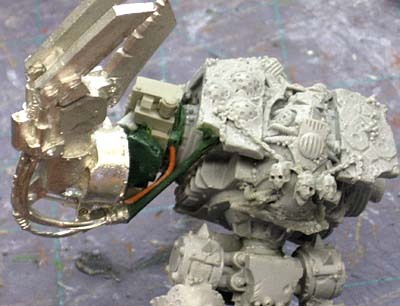 Seems a shame to cut-up such an expensive bit for it, when you've already proven that you can make a standard plastic shoulder look so great on the other arm. 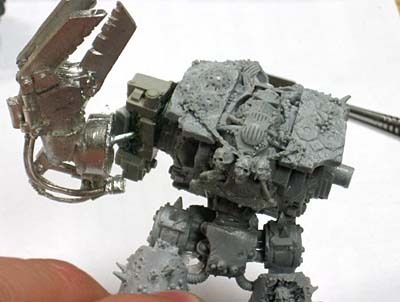 Warhammer 39,999: Thanks, and yes, his right arm was a Forge World shoulder. At least it started out that way.